By Daniel Horowitz--It’s long been believed that education is the most valuable tool at our disposal in order to ensure that humanity is not doomed to repeat its mistakes. When it comes to the Holocaust, teaching the next generation about hatred, intolerance, and antisemitism is vital. Fortunately for all of us, the members of the Jewish Motorcyclists Alliance (JMA) share that sentiment. The JMA, which will be holding its 8th annual - and first Canadian – Ride 2 Remember (R2R) in Toronto on June 1, 2012, has chosen the Holocaust Educators Study Tour – which is perfectly aligned with its philosophy - as the recipient of its fundraising efforts. Every R2R, which is dedicated to the six million Jews who lost their lives during the Holocaust, is an annual fundraising initiative with the goal of funding Holocaust education at local community centers, schools, museums, universities and colleges throughout the world. Under the auspices of UJA Federation’s Sarah and Chaim Neuberger Holocaust Education Centre, this year’s fundraising recipient, the Holocaust Educators’ Study Tour, sends non-Jewish Canadian educators to Europe to visit sites of historical Jewish importance, including Auschwitz-Birkenau and Oscar Shindler’s Factory, where they learn about the Holocaust in a meaningful and in-depth manner. The group is led by professional Holocaust educators and, when possible, a Holocaust survivor. These encounters are supplemented with pedagogical methods and expertise to enable participants to teach about the Holocaust in new ways upon returning to their classrooms. The day prior to the Ride 2 Remember, JMA riders will come together in Ottawa where they will be holding a joint “Never Again” pledge, on Parliament Hill. If you want to see the riders off on June 1st, they will be leaving the parking lot of Thornhill’s Shaar Shalom Synagogue at approximately 9:30 am, before heading south on the 404 to the CNE grounds. They return north along University Avenue before ending their ride at Holy Blossom Temple for a luncheon and brief ceremony. 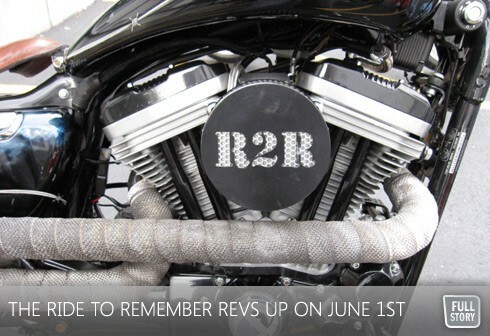 For more information, or to make a donation to the JMA’s Ride 2 Remember, visit holocaustcentre.com.